Blaupunkt's new soundbar separates the woofer -- literally! Blaupunkt who are past masters at delivering good audio, have decided that this compromise is not for them. Sound bars have become a useful adjunct, especially to new -generation LED smart TVs. In the quest to be thin-n-light, these large flat panels have to compromise on the sound and the ultra-small speakers usually belt out from the back. You spend a fortune on the flat screen and then you need to buy a sound bar as an extra, to be placed in front of the screen. Even this involves a compromise as the low height of the bar -- usually about 5 cms -- makes it difficult to incorporate an effective subwoofer for those low-frequency sounds. Blaupunkt who are past masters at delivering good audio has decided that this compromise is not for them. 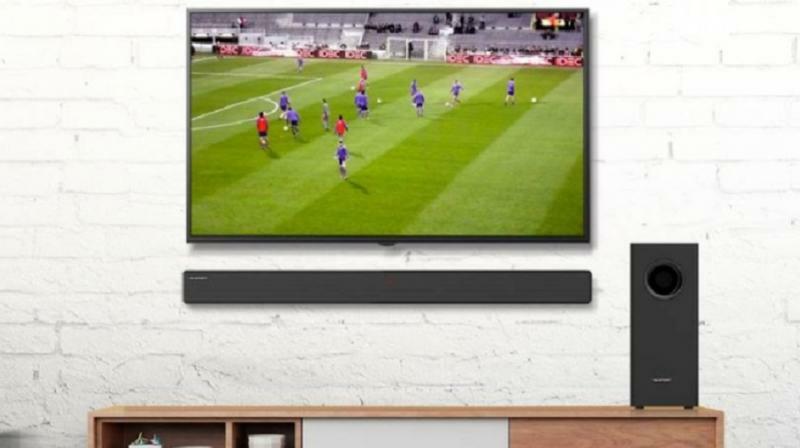 In their new soundbar, SBW-100, they have separated the subwoofer into a separate unit standing some 44 cms high but connected to the soundbar. Now you can eat your audio cake and have it too: the horizontal bar belting out the mid and high frequencies and the woofer providing the bass thumps. They offer 4 preset sounds -- movie, news, sports and music -- and together, put out a total of 120 watts, divided equally between the two units. Blaupunkt's proprietary signal processing ensures a rich and deep sound even if you turn down the volume. The combo costs Rs 12,990… Which may not be too much for decent sound, if your TV costs Rs 50,000 or more.